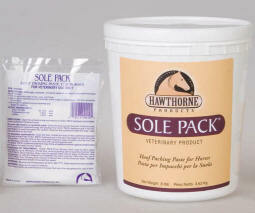 A tidy, easy to use sole poultice. Relieves dry, sore, hard feet. Aids hoof pliability. A good choice for packing as part of a treatment for abcesses, thrush or white line disease. Controls local bacteria and fungus. Ingredients: Pine Tar, Potassium Iodide and Iodine. Use with hoof pads, bandages or boots. Sold as a single pad.